Abu Dhabi: Driverless electric vehicles will transport residents in Masdar City in Abu Dhabi, in the world’s first large-scale outdoor sustainable transportation system. Masdar, the Abu Dhabi Future Energy Company, has selected French autonomous vehicle producer NAVYA to supply the 15-passenger autonomous shuttle vehicles. This is an advanced step from the existing Personal Rapid Transport (PRT) system in the city, which operates in a controlled space. Since 2010, the world’s first permanent PRT system in the city has ferried more than two million passengers between the city’s North Car Park and the Masdar Institute. This driverless vehicle network will be expanded along a new one-kilometre route, linking the institute with the headquarters of the International Renewable Energy Agency (Irena) and the community shopping mall under construction, Stephen Severance, head of Programme Management and Marketing at Masdar, told Gulf News. The existing driverless vehicles are run on isolated tracks. However, the next generation vehicles will operate on the roads, using vehicle infrastructure technology that communicates directly with traffic lights and integration with pedestrians. 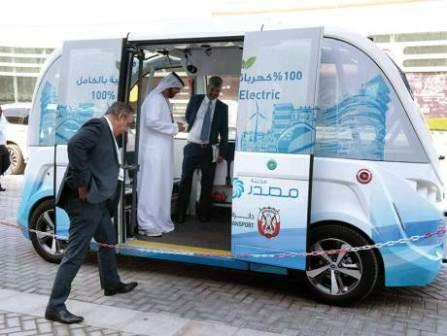 Riding on the new shuttle vehicle being demonstrated during Abu Dhabi Sustainability Week (ADSW) at Abu Dhabi National Exhibition Centre (Adnec), Severance showed Gulf News that the vehicle will stop as soon as it detects any interruption on the road. NAVYA was selected as the most technically and commercially qualified contestant in a year-long competition held by Masdar. Christian Le Borgne, NAVYA’s chief operations officer, demonstrated that the passengers can choose the destination on a digital map inside the vehicle. The 100 per cent autonomous electric vehicle with an operating speed of 25km per hour can run for nine hours without using air-conditioners. In hot summer, it may go down up to four hours. “These shuttle buses are for first- and last-mile transport,” he said. It helps bridge the gap between a mass transit station and a nearby destination. For example, after disembarking from a train station, an autonomous shuttle vehicle can take you to an office, hospital or mall just 500 metres or 1km away. Now 63 vehicles — both shuttle and cabs together — are operating in various countries across the globe. Both vehicles cost the same €275,000 (Dh1.23 million). The cost will go down with large-scale production. It works exactly as Uber or similar taxi fleets. After registering yourself as a customer online, just book a cab on the designated mobile application. The car comes, identifies you and lets you in. You can choose the destination on the app as your mobile is connected to the vehicle’s digital operation system with maps.